Editor’s Note: This is a guest post by Mark Suster (@msuster) a VC at GRP Partners. He blogs at BothSidesoftheTable. Banner Ads. They first started in 1994 and are therefore almost as old as the Web itself. They were very effective back then, with the original ad garnering a 78% click-through rate (CTR)! I guess from there we had nowhere to go but down. Nowadays banner ads get on average 0.2% CTR meaning for every 1,000 ads that are served up only 2 people click on them. And as Jon Steinberg of Buzzfeed points out, the CTRs for social media banner ads are just 0.08%. Despite its creation more than 15 years ago, banner ads have been surprisingly resilient despite their lack of efficacy. In the IAB study that revealed the graph above, brand advertisers indicated that their number one objective in online advertising was “creating awareness” followed by “creating purchase intent” or “likelihood to recommend” the product. Yet these seem to be the least effective attributes of banner advertising. The fundamental problem with banner ads is a condition called “banner blindness” meaning that our eyes are really quickly trained to look at what is most relevant on the page – the content we want to see. 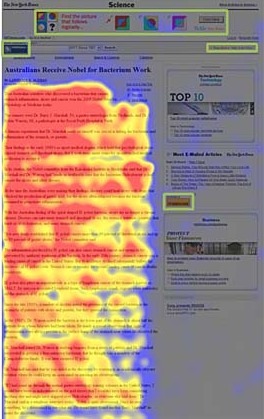 Check out this chart from eye-tracking research conducted by the usability guru Jakob Nielsen published in this piece. It shows that our eyes are trained to focus on the text, not the ads. I’m sure it probably resonants with how most of you read the web. So I’ve spent the last few years checking out companies that are trying to solve for this problem. 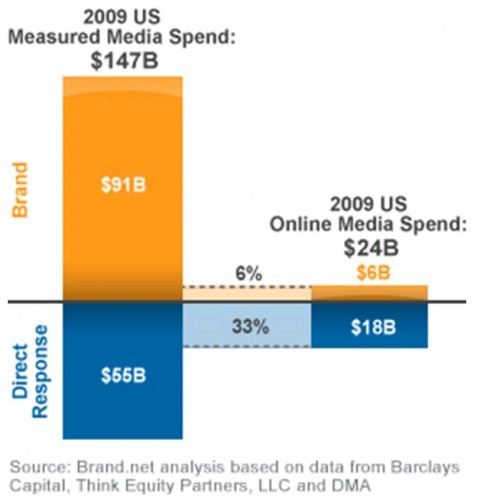 The global advertising market is estimated at around $475 billion / year with only 12% of this online and measurable. (some data sources have this estimate much higher.) We believe that the structural industry changes will continue to create big opportunities for technology firms that enable the changes in media consumption for television, radio, inbound calls, online & social media. We are investing heavily in these changes. One company that I previously wrote about trying to change this industry is, Solve Media, (I am not an investor) has created an interesting ad unit designed to drive up brand “engagement” and recall. The idea is that if I can serve you an ad for a function that you already need to perform on the web anyways – a captcha – with a brand message I can drive recall. And market research seems to confirm this. You’ll see a clear problem here. 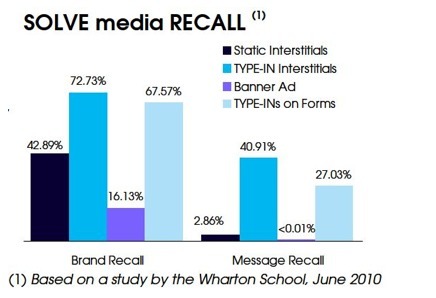 Traditional banner ads only drive 16% brand recall and almost ZERO message recall. So it’s hard to argue that brands shouldn’t worry about CTR rates when it doesn’t seem that banners are very effective for branded advertising or awareness either. It’s no big surprise that the overwhelming majority of online spend has therefore been “direct response” advertisements (trying to elicit an action) rather than branded advertising as pointed out in this good summary by Jeremy Liew. So people will spend money online to get you to sign up for credit cards or Netflix but not to change your laundry detergent. I decided to look up one branded company in the chocolate segment to get a sense for the magnitude of spend online. Hershey’s chocolates spends about $365 million in advertising per year. Just $460,000 of this is spend on online display ads (0.1% for those without a calculator handy). The reality is that advertising has got to become more integrated with content in order to drive efficacy. I know that any time ads are mentioned it makes the blood boil on any self respecting technologist the same way it did when HotWire ran their first ad in 1994 and the way it made Google’s blood boil when Overture launched the sponsored search category. Ask anybody if they like product placements in movies or TV and they’ll resoundingly tell you “no” but marketers know better, which is why the celebrity endorsement industry is a $50 billion industry. But even for the consumer reality sets in. 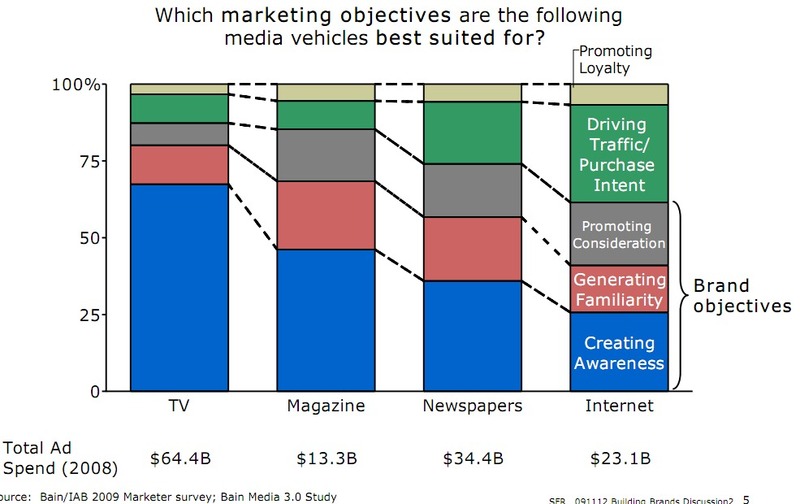 Firstly, we care more about getting cheap or free high-quality media than we do about whether we see ads. Give people massive price increases on most media and they’ll abandon it. So how people behave and what they verbally say they stand for are often at odds. I believe that “integrated advertising” is one of the more effective types of advertising out there. You have to find a way to get your audience to actually “engage” with the content in the way that Solve Media is doing, in the way that in-game advertising works for video games or the way that celebrity endorsements work. It’s why I still believe passionate in companies like Adly (I’m an investor) who have created ways for celebrities to integrate endorsements “in stream” in a Twitter feed. Yes. Oh, sacred cow. In the stream. Integrated with where our eyes & attention are. I advocated strongly for this 18 months ago and my belief system is as ardent as it was back then. If you’re interested here is my case. Our attention is all in the stream. As evidenced by the eye-tracking studies – they will remain in the stream. We know that celebrity endorsement works. It has for decades. Celebrities care about their personal brands so will naturally rebuff requests to sponsor inauthentic products. The beauty of social media is that consumers can vote with their “unfollow button” so it has a natural self-correcting mechanism. If you get economic value out of having followers you don’t want to lose them over one ad. Sure, there needs to be ad disclosure. And naturally we have built in quality controls like: frequency capping, automated measurement so we can pull ads that people respond poorly to, A/B testing tools, data analysis to tell celebrities & brands which products will resonate, etc. But I can tell you as my firm invested in Overture who created the category of pay-per-search that Google perfected – our company underwent three years of ridicule in Silicon Valley until people looked at the performance data and realized that efficacy matters. The technology blogs will be aflutter with continued criticisms of in-stream ads while mainstream consumers continue to click on links provided by the celebrities they respect and will buy products accordingly. We already have the data that proves it. Another areas that I’ve been really focused on over the past 2 years is “in-image ads” as another form of integrated media. When you think about the eye-tracking we know that people care about the story and the images. And it is already an accepted fact that in many cases the ads & images are blended as any lady who reads Cosmo or Vogue will tell you. The big splashy image ads is part of their reading experience. So we put our money where our mouth was an invested in the largest in-image advertiser on the web, GumGum, whose network now reached over 100 million monthly uniques with 3 billion ad-compliant images, delivering an average CTR of 0.4% (2x industry average for banners). The eyes are in the image. We believe this is why Google Ventures invested in Pixazza. As you can see from this image, the ad is unobtrusive and potentially valuable to the reader. The ad unit is served up based on algorithms that determine what is actually in the image and also for whether an ad placement would impair the image. We could even target ads better based on who the end consumer was. What else is out there in the field of integrated advertising? Vibrant Media & Kontera have both built large and fast-growing businesses around text-based advertising and there are new entrants doing it in new ways like SkimLinks. Vibrant has a reach of 250 million uniques, making in the 12th largest ad-focused property online and has 3rd-party verified studies suggesting up to 50% increase in brand lift following their in-text ads (I’m not an investor in any of these companies). Text is shown to deliver higher CTRs than banners. Text is what we’re reading. It’s integrated. There is a whole industry being spawned in the Internet video world and especially in the integration of devices (second screen TVs) and the TV experience. Some of the interactive experiences I’ve seen in recent demos are simply mind boggling and are starting to form new opinions in my head about how we will consume big screen TV in the future (I’ll save that for a future post). The games industry has massively changed over the past several years to more of an integrated advertising / purchasing media with the growth of virtual goods and ads. An obvious example of integrated media would be the new Rio Angry Birds version. It’s actually very cool. There are increasingly incentivized offers to get more powerful swords & shields in battle games. This has proved far more effective than small crappy banners at the bottom of each screen. There will always be a tension between advertising wanting to reach audiences through whatever means they can to capture their attention and help them discover new products and consumers who claim a strong preference for ad-free products. Yet the other tension between ad-free products that cost more versus ad-supported models have a clear winner: ads. On products where I’ve seen data the “ad free” versions have converted at 4-6% of the user base at maximum. So the future of helping make the ad industry more measurable (and more online) I believe will be one of helping make ads both authentic & integrated. Trying to relegate ads to the least intrusive real estate of our computers is missing the point. Advertisers pay for efficacy.